All parents deserve to know how their school is performing, giving them the information that they need to make the best choice for their child’s education. In addition to information on performance for an entire student body, parents and educators needs performance data for groups of students, such as African Americans, Hispanics and low-income students. This information provides much-needed transparency and identifies achievement gaps within a school and across our state. 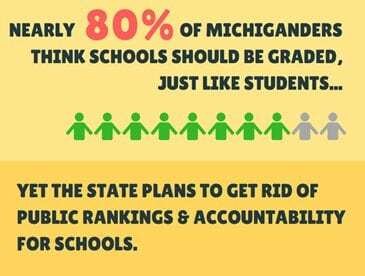 In 2012, Michigan redesigned its school accountability and public reporting system. The new system incorporates a ranking of all schools in the state based on achievement, student learning gains, and gaps between the lowest and highest performing students. 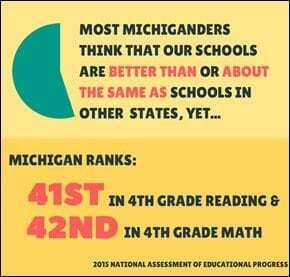 To hold schools accountable and improve education for all Michigan children, we need full and reliable data. The Education Trust-Midwest is committed to fighting for honest, transparent, and rigorous data and accountability for all schools.